The Supreme Court, in Bhagirath Agarwal vs M/s Simplex Concrete & Piles (I) Pvt. Ltd, held that once the court permits the tenant to pay arrears of rent in installments, there is no discretion available with the court to deny interest of the same to the landlord. The Supreme Court, in a recent judgment in National Securities Depository Ltd vs Securities Exchange Board of India, held that “administrative orders such as circulars issued under the Securities Exchange Board of India (SEBI) Act are obviously outside the appellate jurisdiction of the Securities Appellate tribunal”. The Apex Court in Ajitsinh Arjunsinh Gohil vs. Bar Council of Gujarat, held that the Bar Council of India (BCI) cannot remand back a complaint which is transferred to it by the State Bar Council. Quashing a criminal case lodged against a doctor, the Supreme Court held that an ‘error in judgment’ by a doctor does not make him guilty of criminal negligence under Section 304-A IPC. The Supreme Court, in Manoj Kumar vs Champa Devi, upheld a Himachal Pradesh High Court order directing a husband to grant maintenance to his deserter wife, whom he had divorced, from the date when the divorce was decreed. In a significant judgment Supreme Court on Friday held that provision of limitation in the Consumer Protection Act cannot be strictly construed to disadvantage a consumer. The Supreme Court gave a split verdict in a criminal appeal filed by the convicts in a murder case. A bench comprising Justice Prafulla C Pant and Justice RF Nariman disagreed with each other with regard to whether ‘benefit of doubt’ should be given to the accused. The bench was dealing with an appeal against a high court order which had reversed the trial court acquittal. In view of disagreement, the Chief Justice of India will reconstitute a bench which will rehear the case. Chief Justice of India J S Khehar’s bench directed high court chief justices of 12 states and two Union territories to take suo motu action and appoint special public prosecutors to deal with cases of crime against children. The Supreme Court found that the Orissa Olympic Association (OOA) has encroached upon the property of the state government. The court observed that a piece of land, on which 23 shops were constructed and rented out by the OOA, belonged to the state government and a ‘Kalyan Mandap’ was built on government land and a portion of it on the leasehold area of the association. The Supreme Court on Friday formally issued notice to the Centre and some States on a petition which sought a ban on cow protection vigilantes for indulging in violence. The Supreme Court Bench headed by Chief Justice of India J S Khehar’s on Wednesday said a Constitution Bench will be constituted for hearing of protection of Privacy issue in WhatsApp. The Supreme Court on Wednesday dismissed the Karnataka government’s plea seeking review of its verdict in which it had abated proceedings against late Tamil Nadu chief minister J. Jayalalithaa in a 19-year-old disproportionate assets case. The Supreme Court refused to stay the Delhi High Court order by which it had corrected a ‘typographical’ error which had paved way to a double murder convict Jitendra to abscond. Terming the plea as infructuous as several orders have been passed after that, the Supreme Court on Friday turned down a Karnataka government plea seeking review of its September 20, 2016 order asking it to release 6,000 cusecs of Cauvery water per day to Tamil Nadu till September 27. 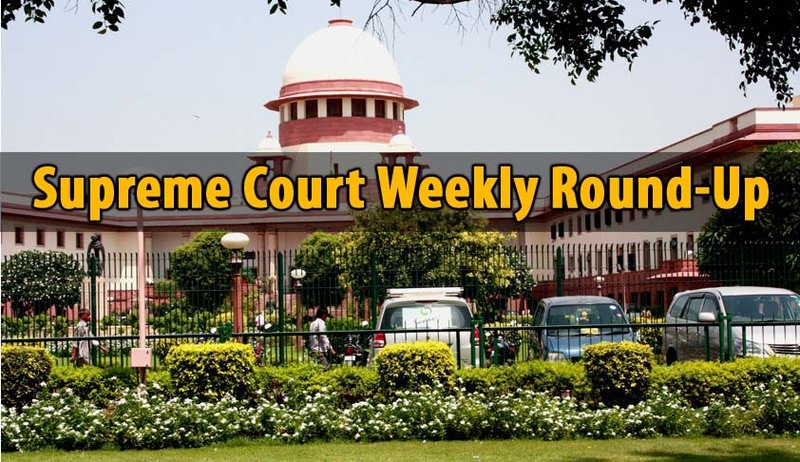 The Centre has been given three weeks time by the Supreme Court to fill up vacancies of presidents and vice presidents in different benches of the Income Tax Appellate Tribunals (ITAT) across the country. The Supreme Court on Thursday reserved order on CBI’s appeal to restore criminal conspiracy charges against BJP leaders including senior BJP leader L K Advani and 20 others in the Babri Masjid demolition case.